Astronomy Now - Find Barnard’s Star, the Sun’s closest stellar neighbour visible from the UK | Astro What? A portrait of Barnard’s Star, a magnitude +9.5 red dwarf 5.96 light-years away that’s the nearest star we can see in a small telescope from the British Isles. Barnard’s Star has the fastest known stellar proper motion, galloping across the constellation backdrop of Ophiuchus at a rate of 10.3 arcseconds per year, or the apparent width of the full Moon every 180 years. Ade Ashford used an 8-inch Celestron EdgeHD with a Starlight Xpress Ultrastar C camera at f/4.3 to capture this image on 5 August 2018 at 22:57 BST. The star’s red colour is clearly evident. North is up and east is left, as in all subsequent images and illustrations in this article. It’s quite likely that you’ve already heard of Barnard’s Star, either as an astronomical fact or in popular culture. It features in at least twenty works of science fiction, movies and computer games. For example, the star is an interstellar transit-stop in Douglas Adams’ The Hitchhiker’s Guide to the Galaxy where protagonists Arthur Dent and Ford Prefect are rescued after being thrown off a Vogon spaceship following the destruction of Earth. These works of fiction make a point of the actual fact that Barnard’s Star is one of the Sun’s nearest neighbours. Just 5.96 light-years away, it’s the closest red dwarf star to our Solar System and the fourth closest stellar body — only the three stars of the Alpha Centauri system are nearer (Proxima Centauri, or α Centauri C, is the closest at 4.24 light-years). At around 7–12 billion years of age, Barnard’s Star might also be among the oldest stars in our Milky Way galaxy. This looping animation shows the northward motion of Barnard’s Star against the constellation backdrop of Ophiuchus over two decades at five-year intervals. AN movie by Ade Ashford based on five images from Steve Quirk. Barnard’s Star is named after American astronomer Edward Emerson Barnard (1857-1923) who carefully compared photographic plates taken between 1894 and 1916, noting a faint star moving quickly against the constellation backdrop of Ophiuchus. In fact, over a period of 180 years, the star traverses a distance equivalent to the angular diameter of the Moon. Barnard Star’s large so-called proper motion is a result of its true motion in space, and a large value is indicative of an object that lies close to the Sun. We now know that Barnard’s Star’s proper motion of 10.3 arcseconds per year is the largest of any known stellar body. It’s a main-sequence red dwarf with a cool surface temperature of around 3,150K (2,877 ºC), has roughly one-sixth of the Sun’s diameter, 14 percent of its mass and shines with just 0.04 percent of the Sun’s luminosity. At magnitude +9.5, Barnard’s Star is too faint to see with the naked eye, but it’s the nearest nighttime star visible in a small telescope or large binoculars from the latitude of the British Isles, which is a good reason to track it down. This is a wide-field finder chart for finding your way to Barnard’s Star. It depicts the naked-eye southern sky view of Western Europe around 10pm local time in mid-August, or 9pm local time at the beginning of September. For scale, the view is 90 degrees wide across the diagonals, or about four spans of an outstretched hand at arm’s length. Bright star Vega is your starting point as it’s near overhead at the stated times. The position of Barnard’s Star is marked by the cross within a five-degree-wide circle shown in greater detail in the chart below. Click this graphic for a high-resolution PDF suitable for printing and use outside. AN graphic by Ade Ashford. 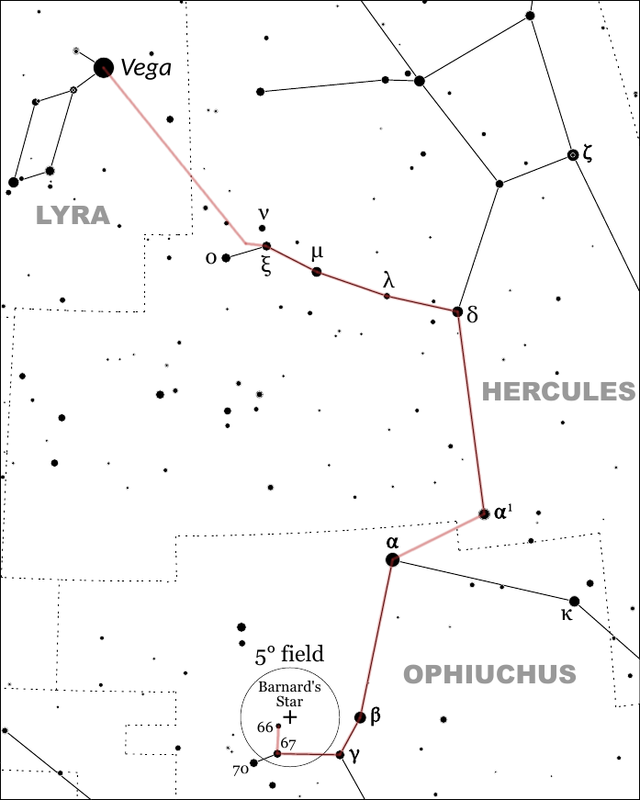 Since our target lies in the constellation of Ophiuchus, late Northern Hemisphere summer is a good time to look for it now that dark skies have returned to the British Isles. If you have access to a printer and haven’t already done so, click on the wide-field finder chart above (or this link) to obtain a scalable high-resolution PDF finder chart. With this in hand and the instructions that follow, you should be able to locate Barnard’s Star in small telescopes and large binoculars with little difficulty. Starting our star-hop from Vega near overhead, move 12 degrees (half a span of an outstretched hand at arm’s length) to its lower right where you’ll find a triangle of third- and fourth-magnitude stars comprised of omicron (ο), nv (ν) and xi (ξ) Herculis – the trio is easily encompassed by 10×50 binoculars. The red line is your star-hopping route from Vega to Barnard’s Star using the instructions in the article text. Click the graphic for a larger version, which is based on an extract of the full-size PDF finder chart above. Stars down to magnitude +6 are shown. AN graphic by Ade Ashford. Next, work your way to the right along the line formed by mu (μ) and lambda (λ) to magnitude +3.1 star delta (δ) Herculis. Here you head south by two 10×50 binocular fields, or the span of a fist at arm’s length, until you arrive at α1 Herculis, a glorious magnitude +3.48 double star for backyard telescopes commonly called Rasalgethi. Your next waymark is second-magnitude α Ophiuchi (aka Rasalhague) some 5¼ degrees to the lower left of Rasalgethi. If you own a pair of 7× or 8× binoculars then you’ll be able to fit both Rasalhague and Rasalgethi in the same field of view. Now you’re on the home straight to Barnard’s Star. Two 10×50 binocular fields of view (or somewhat less than the span of a fist at arm’s length) to the lower left of Rasalhague brings you to magnitude +2.8 star β Ophiuchi. Next, follow a gentle curve through γ and 67, then turn through a right-angle north to 66 Ophiuchi. This last magnitude +4.8 star lies just 0.7° to the southeast of our target, so small telescopes at 40× magnification or less will show both 66 Ophiuchi and Barnard’s Star in the same field of view. This chart for users of large binoculars and telescopes shows stars down to magnitude +10. Stars β and γ Ophiuchi are shown on the wide-field charts near the top of the page, as are the stars with Flamsteed numbers 66, 67 and 70. The inner circle represents the one-degree field of a telescope at about 45x magnification, whereas the outer five-degree circle is the amount of sky seen in a 10×50 binocular. Observers with Newtonian/Dobsonian telescopes should rotate this image through 180° to match their eyepiece view, while users of refractors and catadioptrics (Schmidt- and Maksutov-Cassegrains) with a star diagonal need to mirror this graphic left-right to replicate what they see through the eyepiece. AN graphic by Ade Ashford. If you have a telescope with a computerised GoTo mount then there’s a far quicker way to find it. Just enter the following J2000 coordinates into your hand controller: α = 17h 57.8m, δ = +04° 45’. If your telescope requires GoTo coordinates for the current (J2018.6) epoch, use: α = 17h 58.7m, δ = +04° 45’. Since a large component of its motion through space – 108 kilometres (67 miles) per second – is directed towards the Sun, the distance between our Solar System and Barnard’s Star is steadily decreasing to a minimum distance of 3.85 light-years by the year 11,800. A careful analysis of an apparent wobble in the star’s path by Peter van de Kamp and his colleagues at Sproul Observatory in Pennsylvania led to an announcement in 1963 that the star was attended by a planet about 1.6 times the mass of Jupiter orbiting every 24 years. Sadly, however, subsequent research has failed to confirm the veracity of the claim or to detect any other planetary companions.